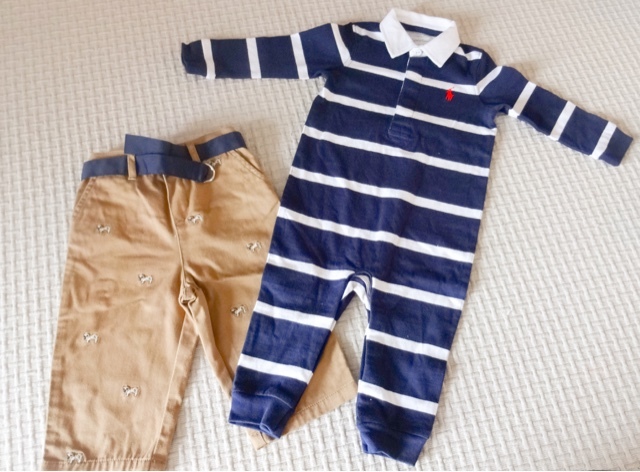 It occurred to me the other day that I hadn’t shared any baby things for quite some time, so I decided to put together a post on some of the lovely stuff we’ve bought for Theo recently. Time flies and he’s over 5 months old now. He’s always been a little on the small side, so he hadn’t actually outgrown his 0-3 months stuff - in fact, some of the things still fit him - but other things are getting a little small, so we’ve been on a bit of a baby clothes shopping spree for the next couple of sizes up. This is such a beautiful piece, a lovely soft chunky knit. Its really useful because its a sort of hybrid between a coat and a cardigan, so its perfect for warmer days as an outer layer, or underneath another coat. I first spotted this on a friend’s little girl as they also do it in pink, and I fell in love with the little bear ears on the hood. I found out they did the same style in navy and grey as well, so I went out and grabbed one. So cute! I dress Theo in a lot of navy and grey colours, so sometimes its nice to add a bit more bold colour into his wardrobe. I love these bright yellow trousers, they’re so gorgeous. They’re nice and soft as well - I prefer soft materials for him as its more comfortable and I want it to be easy for him to move about. For that reason I don’t really like little jeans and I prefer him to wear baby leggings or chinos. He’ll look great in these when they’re paired with his other neutral stuff. Next is one of my favourite places for baby clothes as I find them to be really well made, and this jacket certainly is. 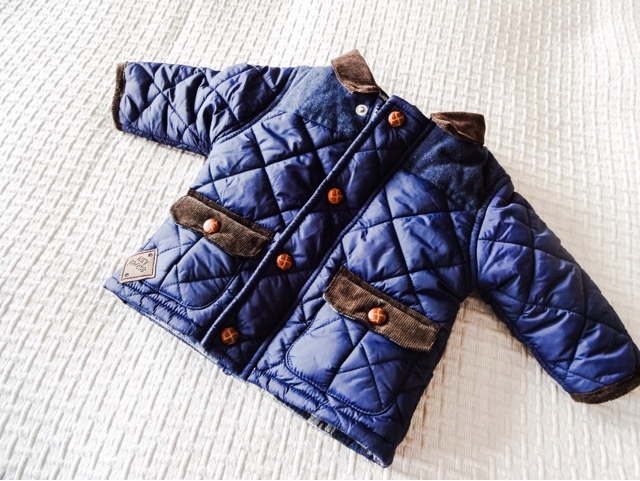 Its a quilted style with a blue herringbone tweed detail on the shoulders, a corduroy collar and lovely little leather covered buttons, blus a warm checked lining. All the detail on this is brilliant, and I love that he matches me in my favourite Barbour jacket when he’s got this on! These were a purchase with our upcoming holiday in Italy in mind. Theo has his passport ready! 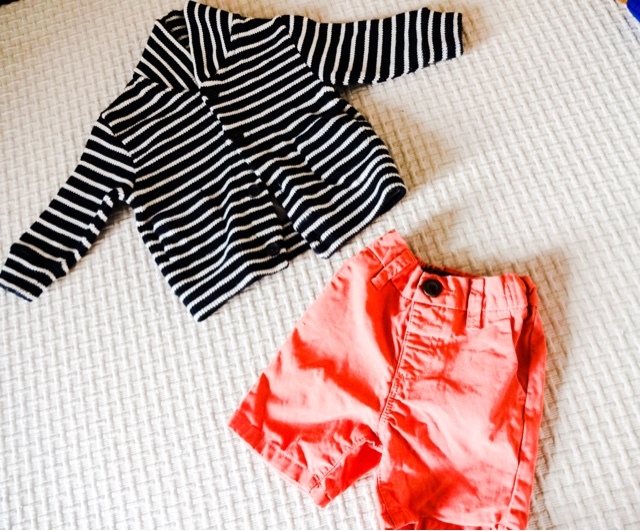 These little salmon coloured chino shorts are soft and stretchy, and I’m sure they’ll look really stylish when he’s sat in a piazza cafe in Rome watching the world go by! 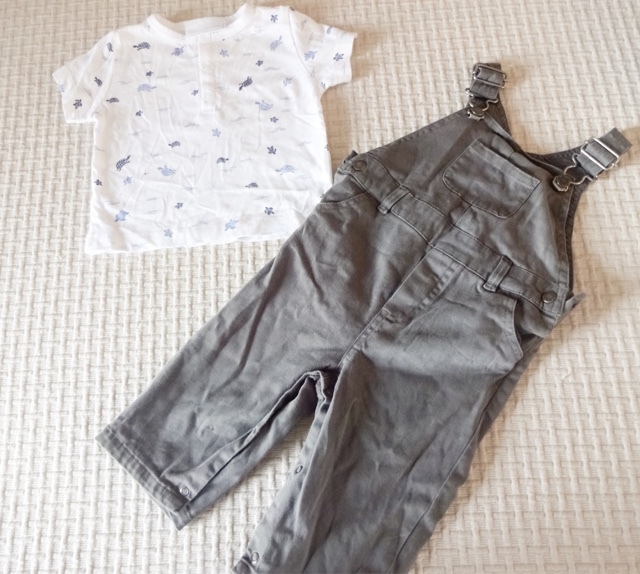 We picked up these little dungarees in the kids section of The White Company. I really like the taupe shade and these looked comfortable to play in. This cute little white t-shirt with prints of sea turtles on was another thing we picked. Its in his current size but rather than a larger one, but it will be good for layering with stuff now, and as I said he’s quite small so I don’t think he’ll grow out of it too quickly! 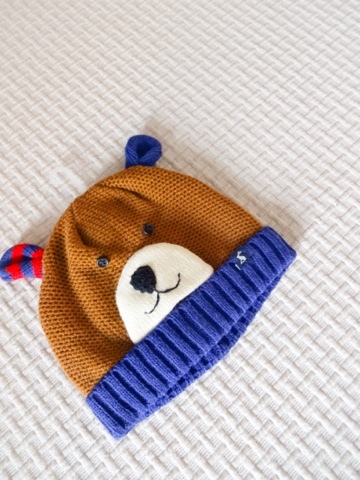 I’m crazy about animal hats on Theo, and we got him a gorgeous Joules fox hat for Christmas, so when my husband saw this bear hat in the Joules sale, he picked it up. Its a large size so I don’t think it will fit him for quite a while, but as its a winter hat that’s just as well - it will hopefully be a few months before its cold enough to need it. 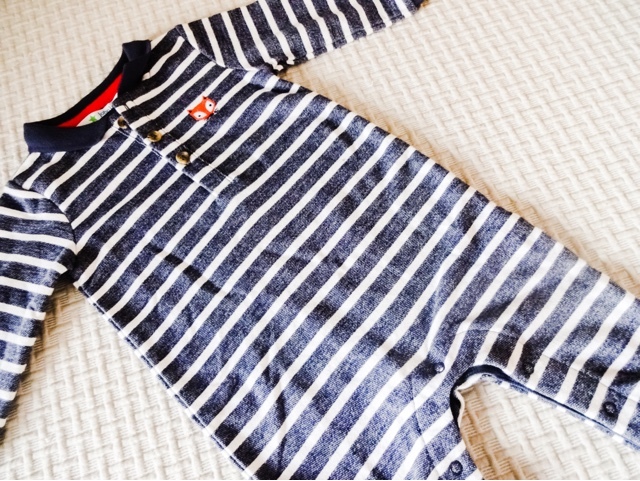 As much as I like little outfits, Theo still wears baby grows a far amount of the time as they’re so comfy for him. I do like them to be smart and have cute patterns though. This gorgeous little set came with a yellow long sleeved vest and a cream baby grow with green and yellow lambs on - ideal for spring. There were also two matching bibs in the set, so he can have some great co-ordinated looks even on his ‘casual’ days. 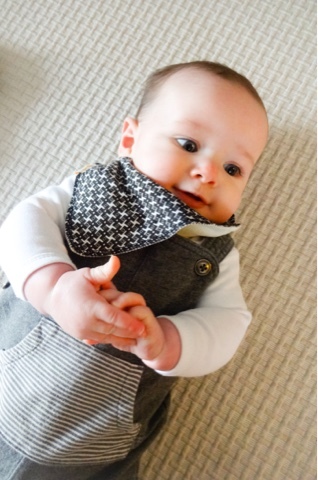 I saw these gorgeous dribble bibs on a friend’s little boy and I had to find out where she got them, because they seemed lovely quality and also came in some great patterns. They’re from Funky Giraffe, and they’re really nice with a fleecy reverse side. Theo dribbles quite a lot now that his first teeth are on their way, so it was a much needed purchase to stock up on some of these. I got a couple of plain colours, some stripes and geo patterns, and even a blue floral print one. The more you buy, the cheaper the individual price which is quite a good way of doing it. I paid £11.40 for five, which is a good deal. This was a lovely gift from a friend and I’ve been waiting for Theo to finally grow into it! I love the little fox motif so much. I’ve got a massive thing for baby grows with collars, as you may be able to tell. It just gives such a smart look to a simple garment. 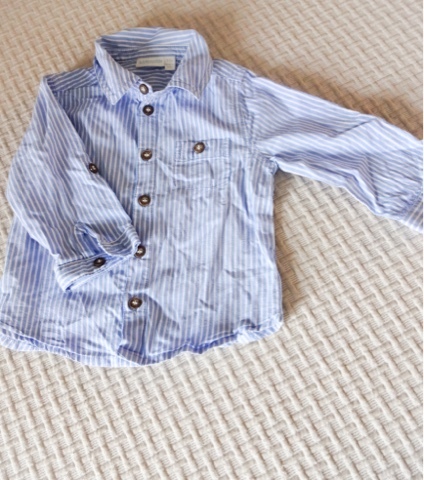 This linen collared baby grow is just gorgeous, he’s going to look so smart in it. Its really light and comfortable, so it will probably come on holiday with him. I have a big thing for the story book ‘Guess How Much I Love You?’. Seb actually got me a copy as a silly little gift a while back and I’ve treasured it. When Theo came along he got his own copy and several nut brown hare toys as well! So when I saw this little outfit at the supermarket with the characters embroided on the front of a stripy tee and soft blue trousers, it had to be his! This is actually Theo’s first shirt. I find them a bit fussy for every day wear sometimes, so I tend to stick to less structured pieces for him usually, but this one won me over as its a little bit softer. It will go nicely with some of his little chinos and things. As soon as I started thinking about having a baby, I wanted one of these little rugby type grows. It’s funny because I wasn’t really ever that broody, but something about these really got to me. I think its because Seb wears a lot of rugby tops and I really wanted my baby to have one and match in with Daddy, who has a sort of preppy style. I finally caved in and got Theo one so he can be Seb’s little mini me. Lastly, we got him these super cute little tan chino trousers. They have tiny puppies embroided all over and a navy fabric belt and are just so smart. I can’t wait to pair them with a little shirt or a plain white cotton top. 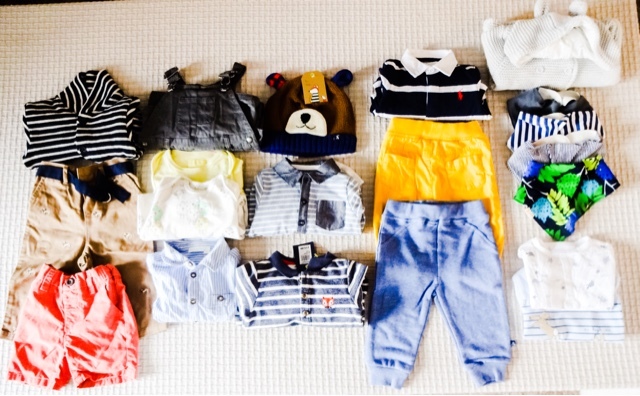 So there you go, a little peek into Theo’s current wardrobe. I can’t wait for him to try it all on!